In my previous post, The Only Houseplant You’ll Ever Need, I explained why I feel the Pothos plant is one of the most versatile plants for your home. If you still need convincing, check out that post here. One of the reasons I absolutely love the Pothos plant is the potential for creating beautiful aquatic plant arrangements from Pothos clippings. 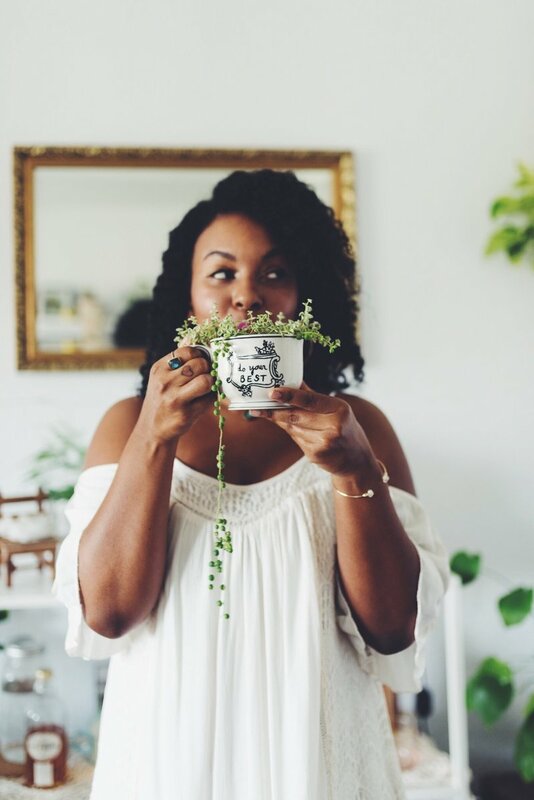 In this post, I’m going to show you the creative ways I style Pothos clippings throughout my home. I hope you’ll be inspired to grow some aquatic Pothos plants of your own. To create your unique aquatic Pothos plant, simply snip off one of the vines at a spot between healthy leaves. Take a few leaves off of the end of the clipping to create a sort of “stem” on the vine, and put the stem end into a vessel with water. You can add rocks if you wish. Keep the stem submerged in water and roots will begin to form. The water will evaporate over time (especially when it’s hot out), so just remember to refill your vessel when needed in order to keep the roots submerged. Pothos clippings can live happily ever after in water alone. Here is one of my longest clippings in a jar. It continues to produce new leaves. Above is my first liquor bottle-inspired Pothos plant. I love the vibrant color of Bombay Saphire Gin bottles (the gin itself isn’t bad either). This style makes a great addition to a bar cart. In this arrangement, I used clippings from two different types of Pothos plants (Golden Pothos and Queen Marble Pothos) and placed them in a repurposed Bourbon bottle. You can see the roots growing from the “stems” of the clippings. I bought this Limoncello because I loved the look of the bottle. Of course, I had to keep it and use it as a vase for a single Pothos clipping. The way the leaves gracefully fall to one side creates a unique, yet classic look. Here I took a clipping of a vine with large Marble Queen Pothos leaves. I removed the leaves from the bottom of clipping (this encourages new roots to grow in their place), and gently pressed the “stem” of the clipping around the shape of this vintage teapot until the leaves were just barely peeking out. Next, I used an additional clipping with a long “stem” to gently place into the spout of the tea pot. The result was a very dynamic, aquatic plant arrangement. If you choose to style your clippings this way, make sure the vessel has enough water in it to completely cover the vine that is funneled through the spout. Here’s the finished look, dreamy right? While I encourage you to be creative with what you choose to grow your Pothos clippings in, there is also the option of using a small vase for a simple, unexpected, and elegant look. My only advice when using a vessel that does not allow you to see through it is to be sure to peek in from time to time to make sure the water is full. So, there you have it. A little tour of my many Pothos clipping creations. I hope you’re beginning to understand why I’m obsessed with the Pothos plant. To see the mother plants that these clippings came from, check out my previous post here. Use filtered water for your aquatic Pothos plants. Fill the water almost to the top of the vessel, leaving some room for air at the top for the plant to breathe. Replace sitting water after a month or so to avoid any fungus growth. Simply pour out the water and replace it with fresh water. If the clipping becomes too top heavy, add a layer of rocks to the bottom of the vessel to help the roots anchor. Snip off yellowing, dry, or otherwise unhealthy leaves, as you would on a normal plant. When purchasing a Pothos plant, look for one with lots of long hanging vines, these are perfect for clippings. Pothos clippings in unique jars make wonderful gifts! Thanks for reading, lovelies. Be sure to leave a comment and let me know what you think. I always love to hear your feedback. I love the way you took the pictures. They’re all so neat and clear! Yess the gin bottle is quite a captivating look. Something about the blue and the green. It’s such an elegant way to style a plant cutting, I just had to share. Thanks again for reading!! This is my mom’s favorite plant and she has styled it just about every way you’ve shared here, haha! I’m going to share this post with her. Love this! My grandmother does the same thing. I haven’t tried this type of plant but may add it to the collection. My babies are a bird of paradise, majestic palm, and scheffelera. That’s so cool! Pothos would fit in well with your other tropical plants. 🙂 thanks for reading! Pothos are my all time favorite!! They are so easy to grow and need so little maintenance.. recently I have planted them in a tiny pot and it looks pretty cute on the kitchen window sill. Very neat pictures and loved your styling !! Pothos are my favorite too!! Have you seen my other post, “The Only Houseplant You’ll Ever Need”? I bet you’d like it! Thanks so much for reading xo!